Emily Ross’s debut novel, Half in Love with Death (Merit Press – December 18th, 2015), chronicles fifteen-year-old Caroline’s quest to find her recently missing older sister. It seems nobody can help Caroline. Her parents can’t stop blaming each other, her friends are all caught up in petty drama, and the police are following up on all the wrong leads. Caroline feels invisible—nobody will listen to her suggestions and nobody seems to want to help. Finally, Caroline finds a willing ear in her sister’s older boyfriend, Tony, who thinks Jess may be in California. As she draws closer and closer to Tony, and gets closer and closer to solving the mystery of her sister’s disappearance, she is also getting closer to death, and she might be pulling away from anyone who can help her. Set in the 1960s in Arizona (and influenced by the story of real-life serial killer, the Pied Piper of Tuscon), the novel presents its rich setting through Caroline’s clever, young eyes, and she sees both the optimistic potential and the depressing hypocrisy everywhere: in the world of adults, in youth culture, on both sides of the tracks, in the status quo and in those who claim to be rebels. The novel has won a fiction award from the Massachusetts Cultural Council. Emily took some time to answer questions about her book, at once a chilling thriller, a genuine mystery, and a moving coming-of-age story. Dead Darlings: Caroline is in many ways a young and impressionable protagonist, but Half in Love with Death has a very literary voice. Was it difficult to find a balance in the prose? Finding and keeping the right voice is like singing a song. You can hear it when you go off key. I listened closely to the voice in my novel to sense when it was either too young, too literary, or too mature. It was more of an intuitive balancing act than a conscious one. The voice for my novel actually came to me from watching Terrence Malick’s movie, Badlands. When I first heard Sissy Spacek’s sweet but strangely flat voiceover in this movie about a teen girl who runs off with a murderer, I knew I wanted that voice for my protagonist. Whenever the voice stopped flowing for me I’d watch the movie trailer to get it back. But as the book progressed Caroline’s voice became more nuanced. She was innocent but also a dreamer and a thinker who sees poetry in the world around her. This made her voice sound literary at times but that is not incompatible with being an impressionable teen. Teens read. They think. They do a lot of soul searching. And because they come from a place of innocence, their thoughts are often touched by wonder. That sense of wonder helped me to harmonize Caroline’s youthful point of view with her more literary side. Dead Darlings: Fashion features very prominently in this novel. Caroline is acutely aware of different fabrics, designs, hairstyles, perfumes… What kind of research did you do to go into such detail? I didn’t have to do much research because I was a teen in the sixties and I remember what I wore vividly. This is a little embarrassing to admit but the fashions of that era actually made a deeper impression on me than the Vietnam War. In addition to mining my own memories I also did some research. 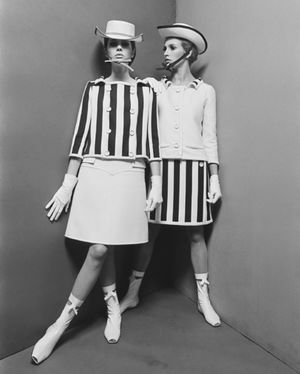 People often associate hippie-chic with the sixties but 1965, the year my novel takes place, featured fashions I like much better, including Andre Courreges’ elegant geometric suits and dresses, and exquisite white go-go boots. I had great fun perusing sixties’ fashion photography books like David Baily / The Birth of the Cool. To get a better idea of what teens (including me) actually wore I turned to Everyday Fashions of the Sixties as Pictured in the Sears Catalogues. Dead Darlings: Do you think some of those early 60s fashions are coming back now? This fall when I visited my local mall I saw fringed vests, lacy shirts, dangling beaded earrings with feathers, jeweled headbands, thigh-high boots, dresses with belled sleeves, and thought wow the sixties are back. But fashion is fickle and when I returned to the mall recently those sixties fashions were gone or on the clearance rack. Apparently their moment had passed. Dead Darlings: The 60s has been a setting for some of the most enduring coming-of-age stories (S. E. Hinton, etc.). How did the era inform the theme as you developed this novel? In the sixties adults and teens sought to ‘find themselves’ in free love, drugs, and rock and roll. It was a time of protests and rebellion, almost as if society itself was coming of age. As Caroline searches for her sister, she is also searching for her own identity. Tony woos her with promises of finding Jess, but also with sixties philosophy about being free and becoming a new person. Her innocence mirrors a greater cultural innocence and popular ideas of that time about the power of love and mystical connection. Her loss of innocence as she comes of age foreshadows the disillusionment that clouded the end of this era. Dead Darlings: Caroline’s sister, Jess, only has a few pages of dialog before her disappearance, but she informs so much of the rest of the novel. How important was it to get those beginning pages right before you moved on in your writing? I’ve learned the hard way that you have to move on before you get those beginning pages right. Otherwise you might not finish your novel. But even though I did move on I was incessantly making small tweaks to my first pages right up to the last edit I did for my publisher. I have pages of alternate beginnings but I kept returning to my original beginning because I wanted the reader to get a glimpse of Jess before she disappears. In the first few pages everything Jess does is motivated by things the reader doesn’t know yet, and I struggled with how much to reveal. As it turned out I couldn’t get that part right until I’d written through to the end. So the beginning was one of the last things I finished. Dead Darlings: It’s easy to detect so many styles and genres within Half in Love with Death: crime, thriller, hardboiled detective, young adult, literary. It would fit in on many different shelves. What were some of your influences? Did you do a lot of reading in the genre realm? I love reading across genres, and many of them influenced my book. One of the biggest influences was Ordinary People by Judith Guest. I am in awe of how Guest conveys the impact of loss on a family without ever descending into melodrama. Daphne du Maurier’s psychological thriller Rebecca about a nameless protagonist in the shadow of the beautiful and darkly mysterious Rebecca, helped me with my portrayal of Caroline and Jess. The poetic prose of crime writers Raymond Chandler and Cornell Woolrich was another influence. There isn’t a specific YA novel that influenced me but I admire how many of these novels accomplish so much in so few pages. Revising my book to make it shorter and tighter so it would be a better fit for this genre was a challenge, but it made my story stronger. Dead Darlings: Your antagonist is a textbook sociopath (antisocial personality disorder, if we want to be technical about it). His behavior is reminiscent of some of the warnings in The Gift of Fear, by Galvin De Becker. Did you do a lot of research into the serial killer psyche? Wow, I wish I’d known about The Gift of Fear when I was writing my book. Most of my research consisted of reading about Charles Schmid, the serial killer in the crime that inspired my novel. Schmid, known as “The Pied Piper of Tucson,” murdered three teen girls in the sixties and buried them in the Arizona desert. I found lots of information about him, including some of his own writing. What I learned was disturbing but at times surprisingly ordinary. He lied. He manipulated the girls who loved him by making up stories to appear more sympathetic or heroic. He preached living in the moment and claimed to seek out reckless death-defying adventures. He was a championship gymnast and he wrote poems. He also admitted to being unable to feel remorse. When someone says something like that there’s a tendency to think, you really don’t mean it, but I believe for once Schmid was telling the truth. Though I didn’t set out to create a textbook sociopath, many details about Schmid seeped into my antagonist. Dead Darlings: Was it difficult, delving that deep in such a dark mind? Did it have an emotional toll? Did you ever worry that you, like Caroline, were becoming entranced? It wasn’t difficult, but I like exploring dark corners of the human psyche. It didn’t take an emotional toll either, though I did have occasional bone-chilling nightmares. I also didn’t worry about becoming entranced, like Caroline, because to make her relationship with Tony feel real I had to put aside that inner voice shouting, “Stop, bad choice,” and embrace the delusional love-struck teen state of mind. But I was concerned about becoming so entranced that I’d lose sight of the terrible darkness in my story. It was kind of a balancing act and when I found myself growing too close to the bad guys, I’d think what if this happened to someone I knew, or god forbid to one of my children. That put everything in perspective. Dead Darlings: What’s next for your writing? Are you working on anything right now? I’m writing a novel about an aspiring ballerina who must prove that her Russian immigrant boyfriend and dance partner is not the mythical butterfly killer who murdered the captain of the high school dance team. It’s set in Quincy, a city that combines the charm of a small town with the gritty darkness of the inner city. I’m having fun writing about dance, murder, and creepy butterflies! Half in Love with Death releases widely on December 18th, with launch events at Trident Booksellers on December 9th and at Porter Square Books on January 7th. For more information on Emily Ross, including future book event dates, please check out her website. A great interview for a great book. As a parent, I found it terrifying, yet I couldn’t put it down. Excellent interview, Jack! It is really interesting and helpful to hear how Emily chose the voice of her protagonist and used the fabric (in the broader sense) of the 60s as vital background material. I am a sucker for anything about that period and for coming of age, so this wonderful book hit two of my sweet spots. I hope it is a huge success! Great interview. Great interviewee. Thanks. “Finding and keeping the right voice is like singing a song. You can hear it when you go off key.” This is such a great description of writing “voice.” You sang Caroline’s voice perfectly! Thanks for this fascinating interview, Jack.